Watch the ceremony again on DR.dk and Eurovision.tv. On January 9, 2014 EBU has announced that a total of 36 or 37 countries will compete at the 2014 Eurovision Song Contest in Copenhangen next May with Slovenia given a 10 day extension in order to confirm its participation. 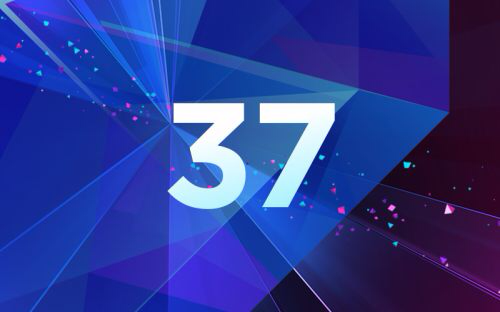 On January 17, RTVSlo Slovenia has finally confirmed it's participation in competition making the total of 37 countries. 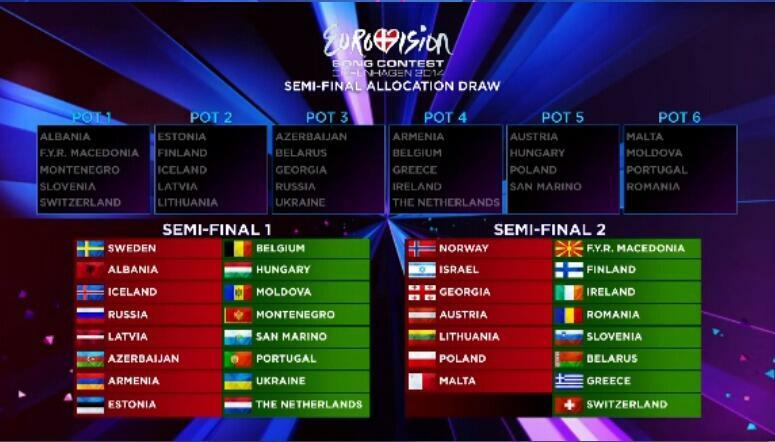 Their neighbours Croatia and Serbia, as well as Cyprus and Bulgaria have decided to opt out of the competition in 2014. Bosnia Herzegovina initially applied to compete in the contest but withdrew its application. Portugal and Poland will return to the contest this year, whilst Greece will participate in Copenhagen with its new broadcaster NERIT, which isn't yet a EBU member, but was given special acceptance considering situation with public television reform in the country. This means that this year's 37 participants are the broadcasters in Albania (RTSH), Armenia (AMPTV), Austria (ORF), Azerbaijan (Ictimai TV), Belarus (BTRC), Belgium (VRT), Denmark (DR), Estonia (ERR), Finland (YLE), France (France 3), Georgia (GPB), Germany (NDR), Greece (NERIT), Hungary (MTV), Iceland (RÚV), Ireland (RTÉ), Israel (IBA), Italy (RAI), Latvia (LTV), Lithuania (LRT), FYR Macedonia (MKRTV), Malta (PBS), Moldova (TRM), Montenegro (RTCG), the Netherlands (AvroTros), Norway (NRK), Poland (TVP), Portugal (RTP), Romania (TVR), Russia (RTR), San Marino (SRMTV), Slovenia (RTVSLO), Spain (TVE), Sweden (SVT), Switzerland (SRG SSR), United Kingdom (BBC) and Ukraine (NTU). 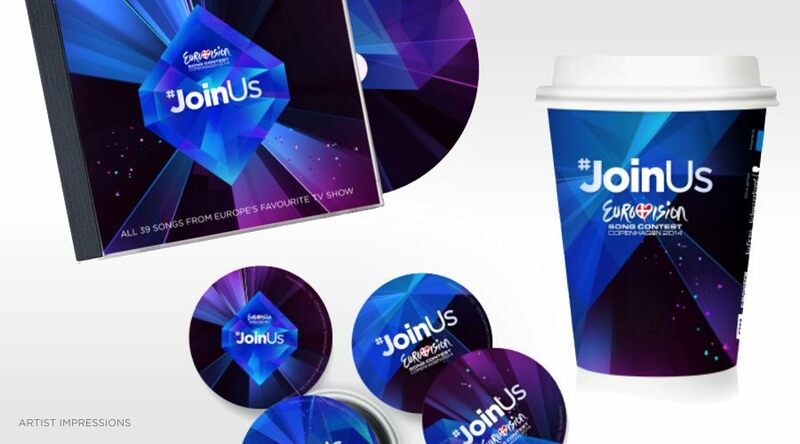 "Several broadcasters already expressed their interest to return in 2015, when we celebrate the 60th anniversary of the Eurovision Song Contest. We will also continue to work with broadcasters who are facing challenges. The EBU froze participation fees for 2014 compared to last year. In 2013 we already shortened the rehearsal schedule with a day, cutting costs for delegations staying in the host city. This year, host broadcaster DR and their local partners negotiated sharp hotel prices"
The allocation draw for the 2014 Eurovision Song Contest semi-finals will be held on Monday 20 January in City Hall of Copenhagen, where a total of 28 countries will be divided and drawn into 2 semi-finals. It will be broadcasted live on Eurovision.tv and DR.dk at 14.00 CET. On the same day city of Copenhagen will be officially entrusted Eurovision insignia from last year's host city, Malmö. Ceremony will be attended by mayor of Copenhagen Frank Jensen, mayor of Malmø Kent Andersson, Eurovision-boss Jon Ola Sand and DR director general Maria Rørbye Rønn. Hosts: Tine Gøtsche and Ulla Essendrop. 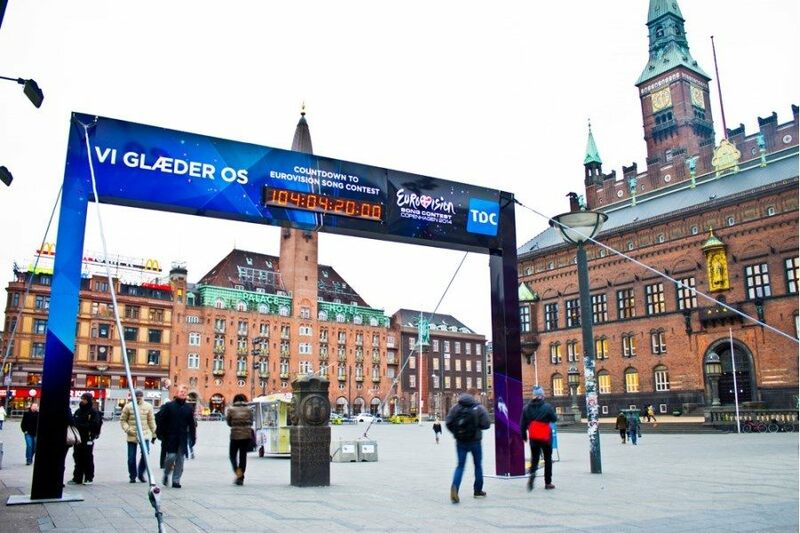 During the ceremony, countdown to the opening party clock on Rådhuspladsen will also be started. Sweden, Norway and Israel have been pre-allocated prior to the draw. Sweden will compete in Semifinal 1 whilst Norway and Israel will compete in Semifinal 2. The distribution of the countries in the 6 pots has been based on the voting pattern in each country in the past 10 years. This mechanism is used in order to avoid neighbourly voting and countries that tend to vote for each another ending up competing in the same semifinal. Another draw will determine the appearance of the country in its respective semifinal (1st half or 2nd half of the semifinal). The BIG 5 (Italy, France, UK, Spain and Germany) countries and hosting nation Denmark will vote in the semifinals too and a draw will also determine which country will vote in which semi-final. Germany has requested to vote in Semifinal 2. The first batch, approximately one third of the total number of tickets for the show, went on sale on November 29, 2013 at 10.00 CET through Billetlugen.dk. More tickets are to come on the 31st of January and in April. Currently, all tickets for all the shows of the Grand Final are sold out but more will also come on the 31st of January. First batch of tickets for the final was sold in 75 minutes. Approximately 10,000 spectators will be fitted into the arena. 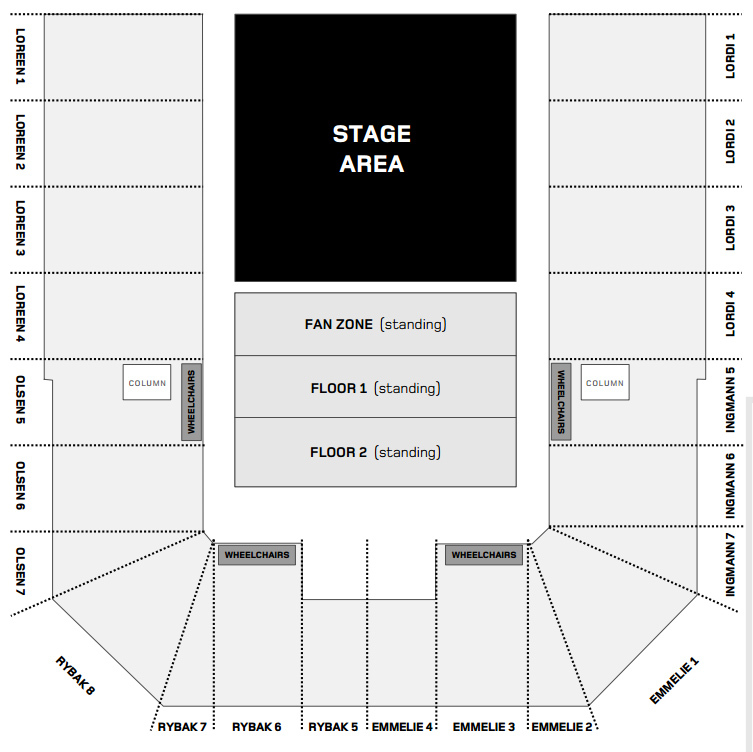 There will be 3 standing areas in front of the stage including a fan zone. The other seats will be placed around the hall under 6 sections. DR has named these sections after previous eurovision winners: Danish Emmelie, Olsen and Ingemann; and Scandinavian Loreen, Rybak and Lordi. All tickets to be send by regular post. The handling fee is approximately 4 Euros (30 DKK) and shipping costs 3,4-4,7 Euros (25-35 DKK), depending on your location. OGAE, Organization of Eurovision fans, has been provided 2000 ticket packages for special discout price of 2500 DKK (~335€) + service fee each. The ticket package will include 6 tickets, 3 for each show, and three for each 2nd rehearsal. It means that there has been a slight overbooking, since fan clubs have requested approximately 2300 tickets. 60% of tickets will be standing in a special "fan standing area", 40% of tickets will be seats divided into two areas, one on each side of the stage. The price is the same for standing and seated packages. In order to buy an OGAE package, one need to have a valid OGAE ID-card with 2014 sticker. The final OGAE package booking deadline has passed on December 16. Ticket sales have started on January 18 and will last until January 26. The physical tickets will be handed over in Copenhagen by respective national clubs, but e-mail tickets still should be printed out as proof of purchase. OGAE Rest of the World has been granted right to purchase out 73 ticket packages, which were divided upon requests of our members as 60 standing and 13 sitting. The Australian members, whose credit cards are not being accepted by service are advised to contact first their local bank issuer, and then Billetlugen, between 10am and 5pm Monday to Friday on +45 70 263 267. For all updates on the OGAE RoW ticket sales please check our Facebook page. DIS Congress Service A/S has been selected to handle the hotel accommodation for the delegations, press, sponsors and fan clubs. A number of hotels in different categories have been pre-booked in the Copenhagen area for these purposes. Every official hotel will be served by a free shuttle service to the venue. Accommodation booking tool & accreditation system open on January 21 at 12.00 CET. Hotels will be confirmed on a first come first served basis. Upon booking of rooms the below pre-payments will be required. All payments must be made in Danish kroner by bank transfer. 1st instalment: within 8 days from booking date	20 % of the total room price; 2nd instalment: March 21, 2014 - 50 % of the total room price; 3rd instalment: April 11, 2014 - Remaining payment. In case of cancellation: Before March 12 the full payment will be refunded. Between March 12 and April 25, 25 % of the total booked room nights can be cancelled free of charge. Cancellations received after April 25 will only be refunded if DIS Congress Service is able to allocate the room to another guest. In September last year DR website has reported that cheapest accomodation for Eurovision week according Hotels.com is at 9153 krone (1226 Euro), and only for a hostel. Check on January 18th has shown that the cheapest option for a week is bed in 8-bed dorm room in hostel for 581 Euro (4335 krone). In the week before, you can stay in a real hotel for 3600 krone. 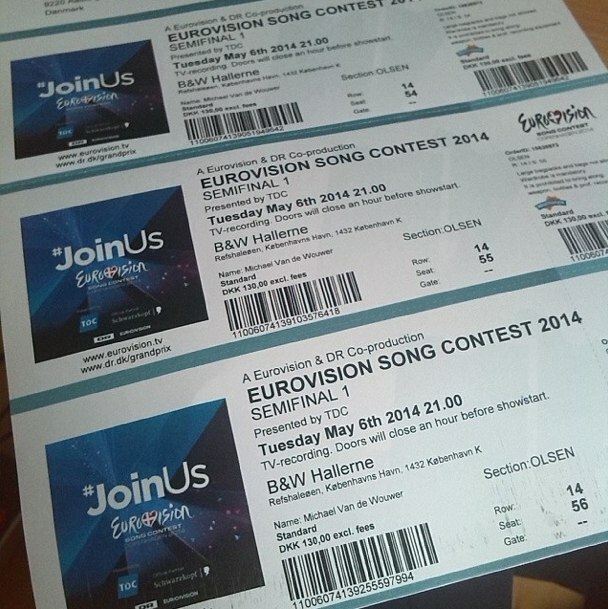 That demonstrates that prices have more than doubled for Eurovision weeks. One of the Copenhagen's largest hotel providers Arp Hansen has also decided to put up prices. The cheapest stay, which is Gentofte Hotel, is costing 11,334 kroner, while in the week before the Grand Prix it costs 8814 DKK. In week 15 - ie a month before Eurovision - it only costs 5714 krone. The most expensive is stay on a Copenhagen Island. The cost of a room during the Grand Prix is 17,000 crowns, while the price in the previous week is 7988 DKK and a month before only 5148 DKK for one week. Arp Hansen CEO Dorte Krak has stated: " During Eurovision in May 2013 our hotels have been fully booked most of the month due to the many activities within the business life and culture. Our pricing reflects, of course, how busy we estimate that the period will will be in a city at any given time. The month of May is one of the year's busiest months anyway, so we price our hotel rooms after the expected demand". Copenhagen has been chosen as host city of the 2014 Eurovision Song Contest, Danish public broadcaster DR announced on September 2, 2013. The event will be held at the B&W Hallerne at the Refshaleoen, under the slogan 'Join Us'. 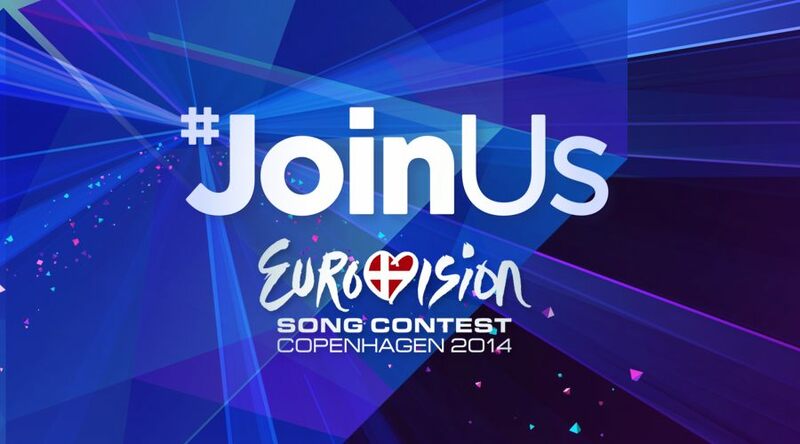 Motto "Join Us" means Closer to the participants, the music, the Danes, the Europeans and the competition. 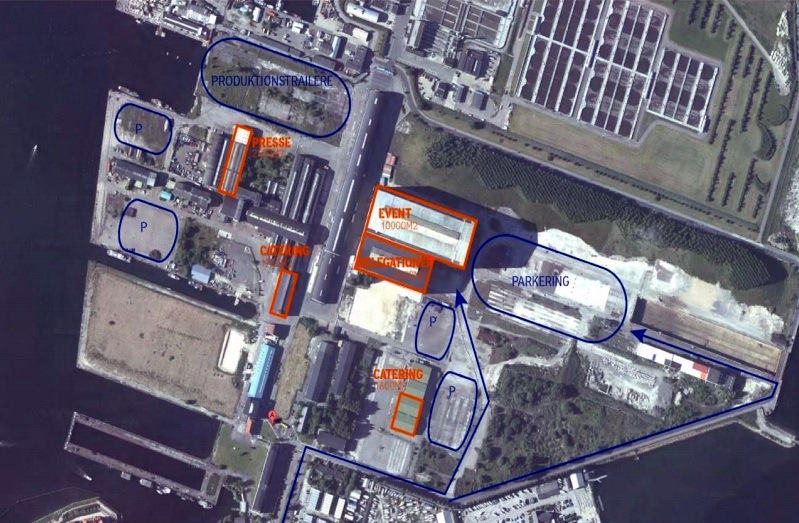 The former shipyard will undergo all necessary improvements to be able to host three state-of-the-art television shows in May next year. The choice was approved by the European Broadcasting Union (EBU/EUROVISION) and the Reference Group, the contest's governing body on behalf of the participating public broadcasters. Copenhagen has hosted the Eurovision Song Contest two times before; in 1964 and 2001. The Danish capital also hosted the contest's 50th anniversary in 2005. "We are looking forward to welcoming Europe in Copenhagen, which is full of cultural diversity, has an excellent infrastructure and a variety of hotels. At the chosen venue we have the opportunity to realise our creative ambitions. The entire area around the B&W Hallerne will be transformed into Eurovision Island, where delegates, press and fans will come together", says Pernille Gaardbo, Executive Producer of the 2014 contest at Host Broadcaster DR. "Copenhagen is one of Europe's most popular tourist destination and has what it takes to host an event of this scale", says Jon Ola Sand, Executive Supervisor of the Eurovision Song Contest on behalf of EBU/EUROVISION. He adds: "The chosen venue is a bold creative move, and we are confident that the good cooperation between DR and the City of Copenhagen will result in three shows that Europe will remember for a long time!" B&W site is a unique piece of international industrial history. 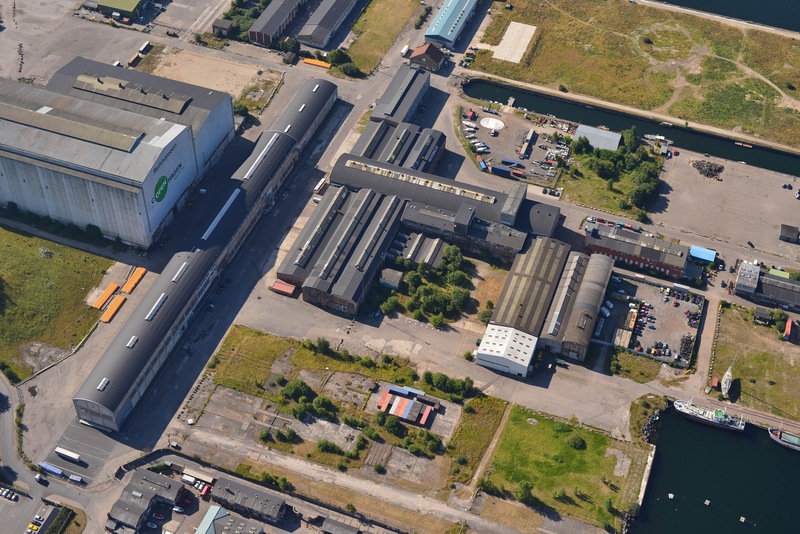 Constructed on artificial island (or rather peninsula) Refshaleøen in 1872, shipyard was international leader in development of construction of ships and ship engines. 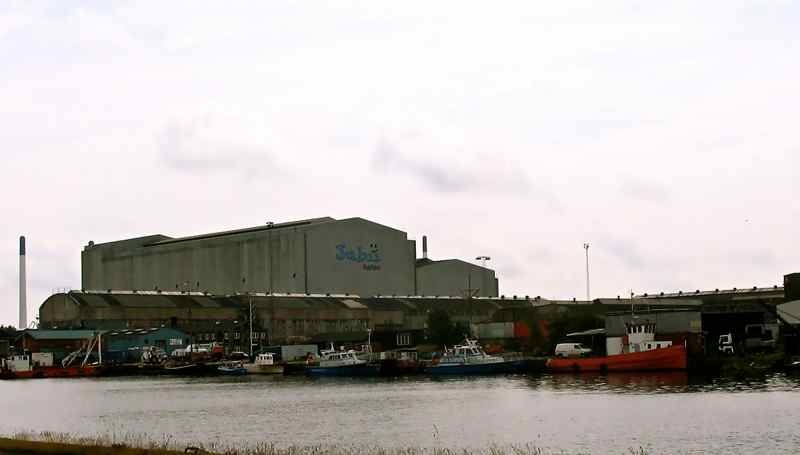 Refshaleøen has hosted shipyard until 1996. 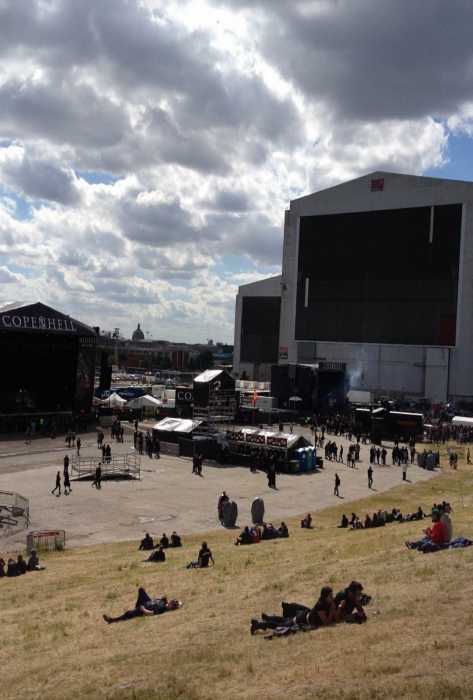 Today, it serves as a playground for culture and entertainment industry, houses leasure centers, galleries, beach and restaurants, and has already hosted number of high profile events - such as Copenhell festival or Scandinavia Reggae Festival on 30-31st of August. 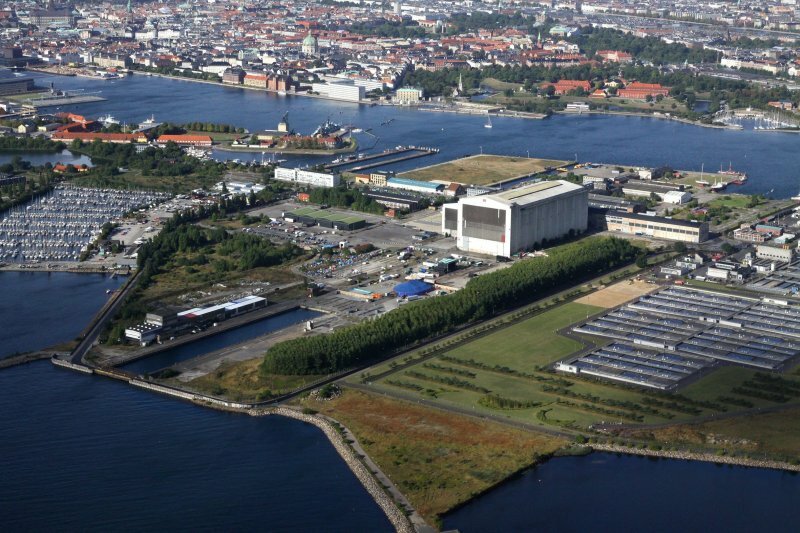 During the last event the location has been labelled as "10 minutes walk from Christiania". 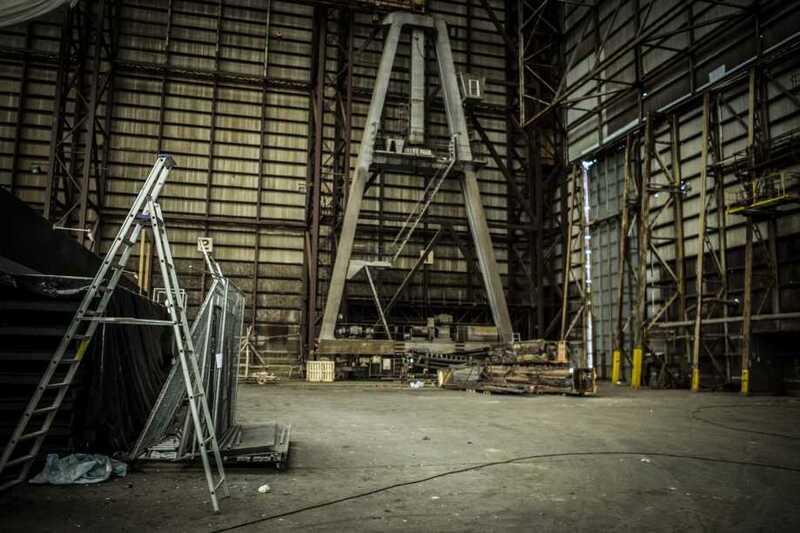 This is a "clean venue" with its raw and industrial look that can tailored exactly as needed. In the many surrounding areas and buildings, there is ample space to meet requirements for production, press, parking, catering, sponsors etc. says Pernille Gaardbo, producer of the event. "We have already teamed up with best acousticians and engineers and they guarantee that sound will be fit for professional television production", she adds. 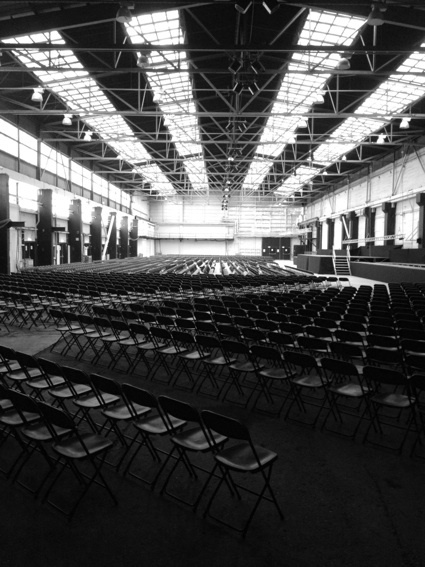 The exact chosen venue for Eurovision is a building from early 1960s commonly known as Jubii hallen (Gossip hall, for it's former sponsor - Danish search engine, not this name will be used during Eurovision, but rather simple B&W hallen) and officially labelled as Sektionshal 2 - it is former shipbuilding hall, which now serves as warehouse for the Royal Theatre - mainly packed in shipping containers. 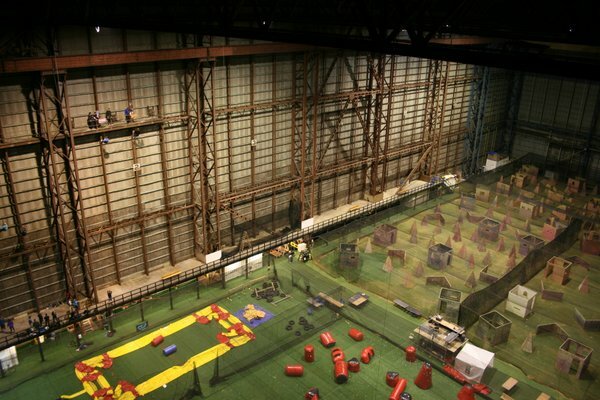 At 50 meters high in the venue is also constructed a High-Ropes Course - A commercial leisure activity, combined with the net at 25 meters high. 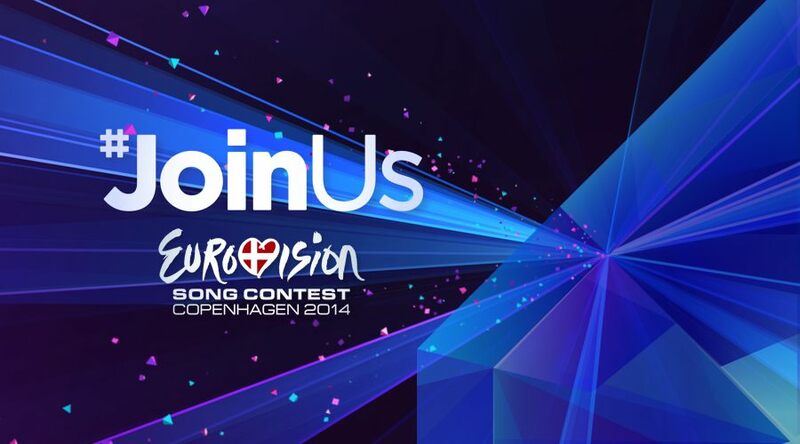 For Eurovision period this activity will be shut down and net will be removed. 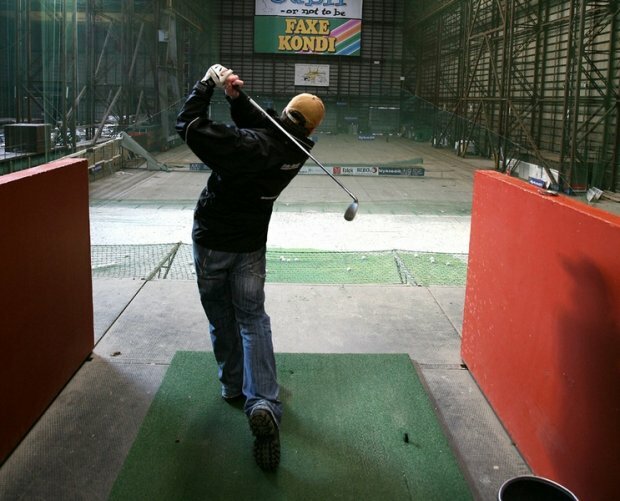 Earlier, hall also hosted indoor golf center, and already in 2010 it has been proposed as suitable for major concert productions. Hall has size of 10.000 m2, with dimensions of 55x60x165. It is expected that it will offer capacity of around 10000 viewers for Eurovision and will be decorated and illuminated from outside as well. 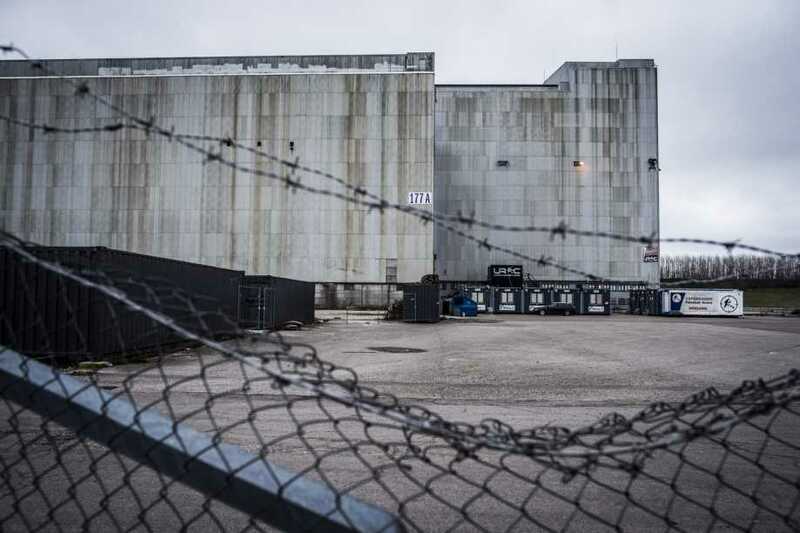 In addition to it, as space for delegations, will be used Copenhagen Paintball Arena (Sektionshal 1), which is adjacent to S2. It can also be easily cleared. 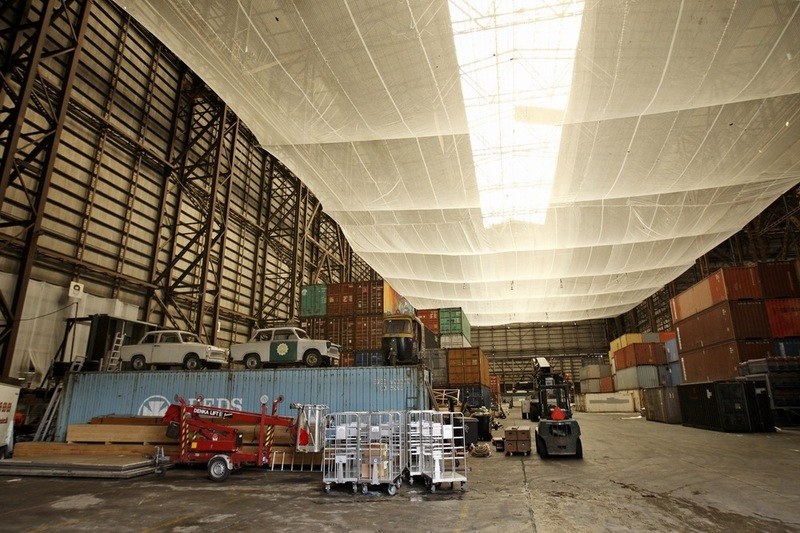 It provides space of 6000 m2 with dimensions of 45x50x115. 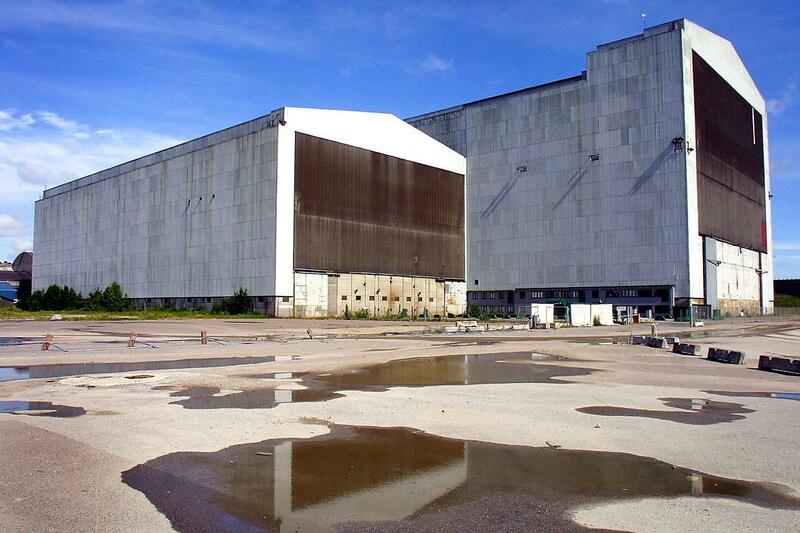 It is planned to unite the halls in one and build inside an audience platform of 30 meters high. Office facilities, VIP room, lounges, restaurants will also be build at these venues. Press-center will be located 200m away from the main venue in B&W Grand Ballroom hall - hall of approx. 8,000 square meters will be able to fit at least 1500 journalists. Interestingly, on 3rd of May in this hall will be held a Grand Concert - Tribute to Danish Melodi Grand Prix (En Hyldestkoncerttil Melodi Grand Prix 1957-2014). It is currently unknown how this will reflect on plans to set up a press-center in this venue. Differently from Malmö edition, it is expected that this year press-center will be open from the day 1. Currenlty Refshaleøen is served only by public bus 40 and water bus 991/992 (which is operating only up to 20.30 as water transportation usually is not allowed in dark hours), there is no subway, so the venue is not as easily accessed as it may seem. The adjacent roads are among the most busy in the city and it will be technically very difficult to run there big shuttle traffic as well. Organizers have claimed that: "The location by water opens up the possibility of alternative transportation methods for both audience and delegates, journalists, etc". 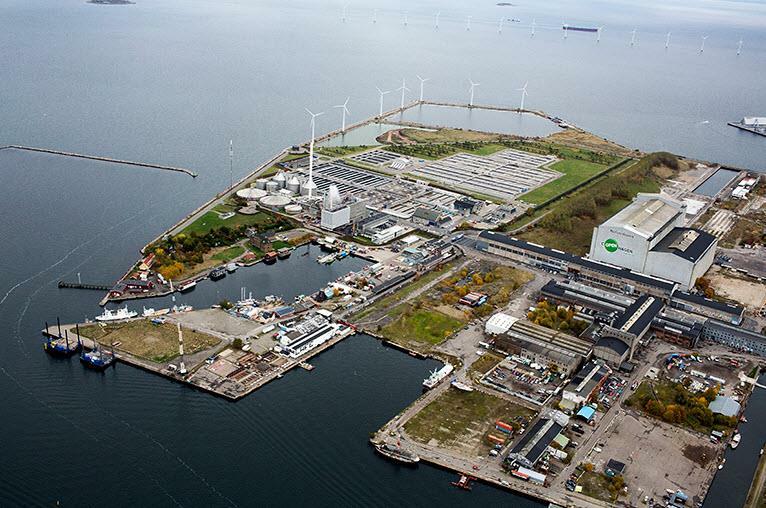 The bid documents however state: "Developed public system of Copenhagen will allow to decrease number of shuttle-buses used for delegates and press, which will be both economical and ecological friendly decision. All delegates and press will receive "Congress Travel Pass" which will allow free access to metro, trains and buses in the city. All delegates and journalists will also be given access and encouraged to use bicycles for their journeys"
"Eurovision Island will be full of restaurants, bars and an entertainment stage. 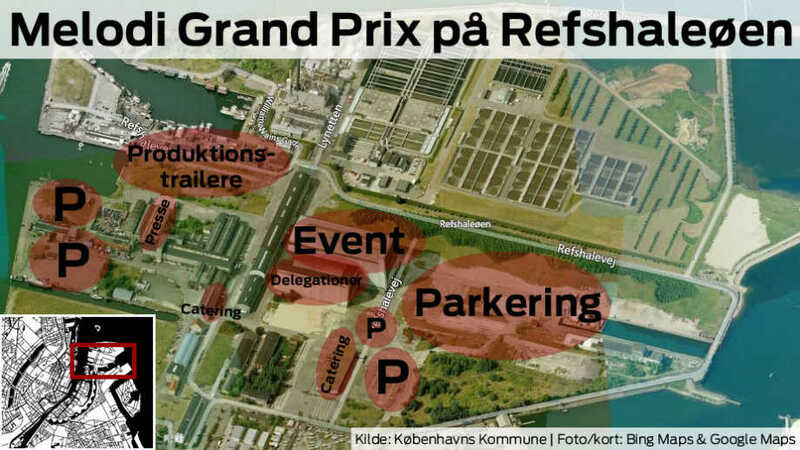 It will be an environment that uses both the existing facilities but also with more of an edge", says Ulrik Ammundsen, Event Chief at Wonderful Copenhagen. 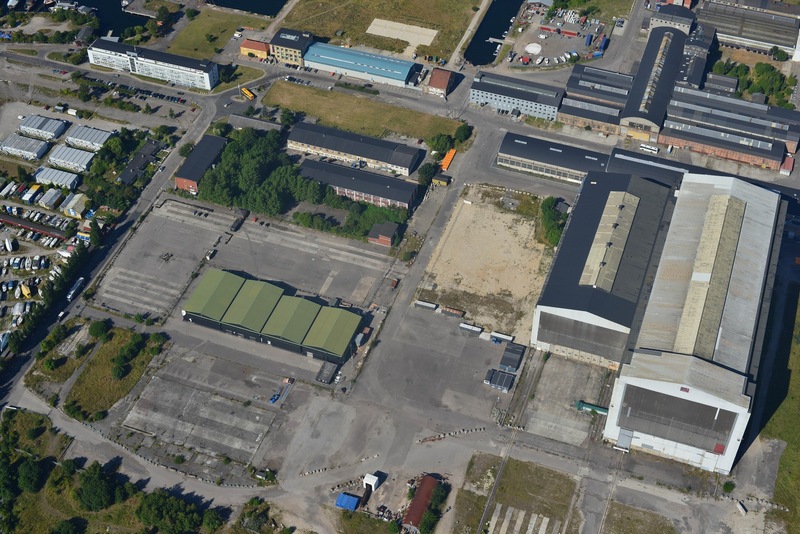 You can read about existing businesses on Refshaleøen here .Around the venue will be build Eurovision Park of over 40.000m2 width, among other activities and rides, musical performances and the ability to get food and drink. Even Royal family ship is expected to be placed in harbour at the venue. Ammudsen also reveals that the volunteers will play decisive role, because they will need to be very visible and and approachable. Wonderful Copenhagen has been accepting applications from interested persons on positions of volunteers till January 12. The conditions: at least 20 years old; speakers of Danish, English and at least one participating country language on a native level with throughout knowledge of this participating country and Copenhagen/Denmark. Volunteers on the positions of countries hosts (2-3 hosts per country) will be appointed in February after brief live auditions and language tests. Information Workshop for them will take place in early March. The hosts will meet their delegation upon arrival to Denmark and accompany them throughout their stay in Copenhagen being the link between the delegation and the Host City Copenhagen team leaders. 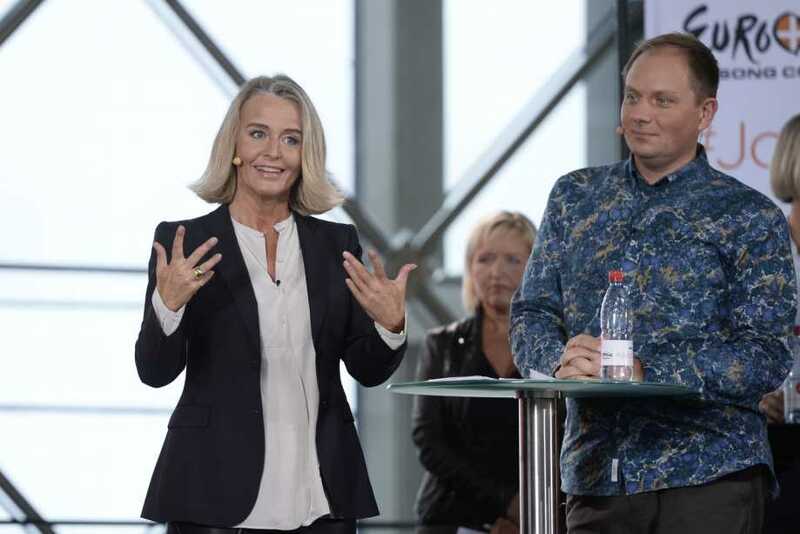 Just three days after Denmark's victory at the 2013 Eurovision Song Contest, broadcaster DR has appointed the Executive Producer for 2014 show - 47 year old Pernille Gaardbo, who has been working at DR for 17 years - the last 12 years at the helm of DR Medieservice. Also part of the team that is responsible for planning and producing the Eurovision Song Contest in Denmark in 2014 is Head of Entertainment Jan Lagermand Lundme and the Head of DR Event, Søren Therkelsen. All in all, organizing broadcaster DR already has 500 people working for the Eurovision party. One of them is Jill Paulsson, she will resume her job from Malmö as Head of delegation service. "It's a hub that is sparkling and strong. The diamond has lots of different facets and shows the diversity and the wealth that comes to stand on the Eurovision stage. It visually emphasises the approach we have to Eurovision 2014: The raw B & W Haller combined with the sparkling show, and in the middle of the stage, the diamond as a unifying force. A diamond is indeed the finest material as it both unifies and energises. If we can do what we dream of being able to do – to move and move people – it’s the best that can be achieved. We wanted to express that through the diamond". 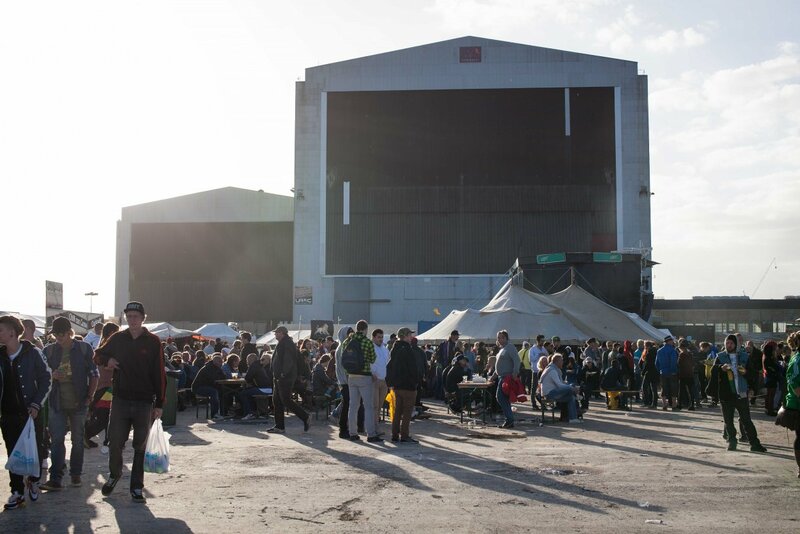 Head of Show, Jan Lagermand Lundme says that DR has a clear ambition to link the stage design and show to the fascinating historic industrial area surrounding Refshaleøen. Right now a lot of work is being done to ensure the halls' raw and industrial look is preserved, but at the same time DR are very keen to make sure that the accoustics are as good as possible in time for the show. "Right now we are working to place the stage right in the middle of B&W Hallerne, where the party will take place, because the stage will then become an island and a centre. It is here the participants will shine and here we will come together"
Claus Zier has been appointed stage designer by DR and will be responsible for the scenography of 2014 Eurovision Song Contest. Together with three other architects he is already working 24 hours a day to create the perfect setting at the B&W Halls on Eurovision Island in Copenhagen. He has made the stage design for shows like X Factor, The Voice Denmark, Dancing With The Stars and Dansk Melodi Grand Prix, the Danish national final for Eurovision. His ambition is to create the biggest, most beautiful and surprising show that makes the Danes proud and unites Europe. 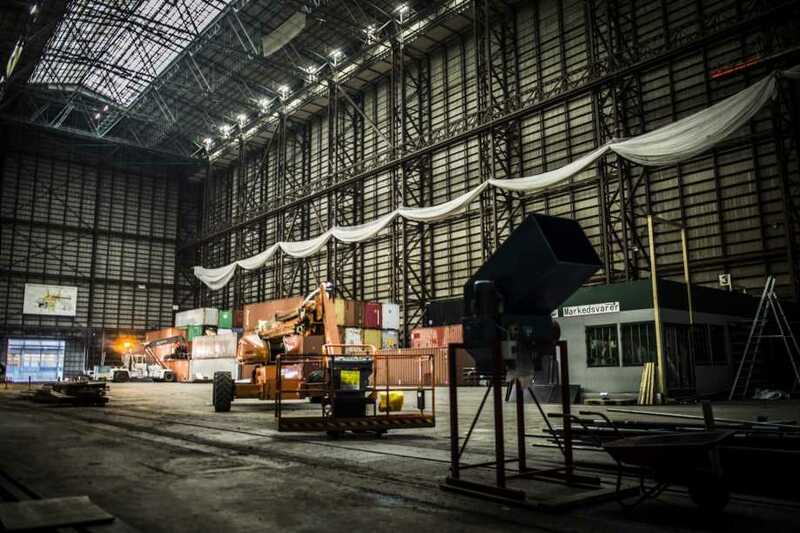 "It is a fantastic opportunity to create a magnificent show in this rusty industrial hall. I have been out to have a look and you can feel the hall's history when you are in it. The transformation we have to make is incredibly fascinating. The stage has to be strong enough visually that no one is in any doubt that it is the same show, even though each country has a different expression. We have a fanastic amount of height that we want to take advantage of, and we want to make magic in this space." 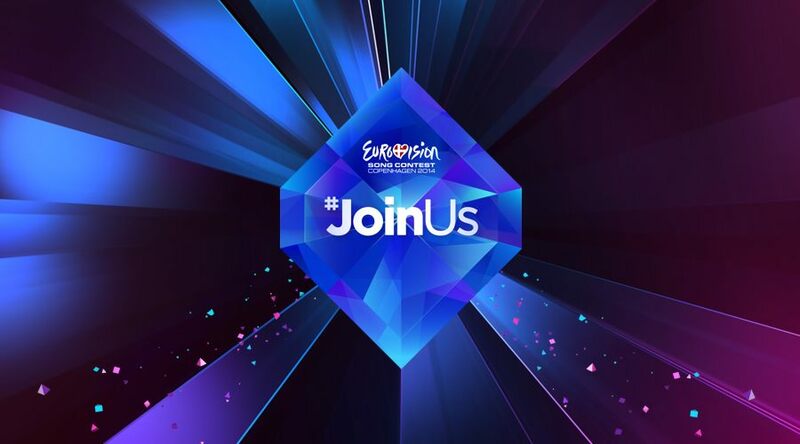 On December 19, Danish broadcaster, DR, has invited fans to submit their ideas on what they’d like to see during the intervals for the Eurovision Song Contest 2014. 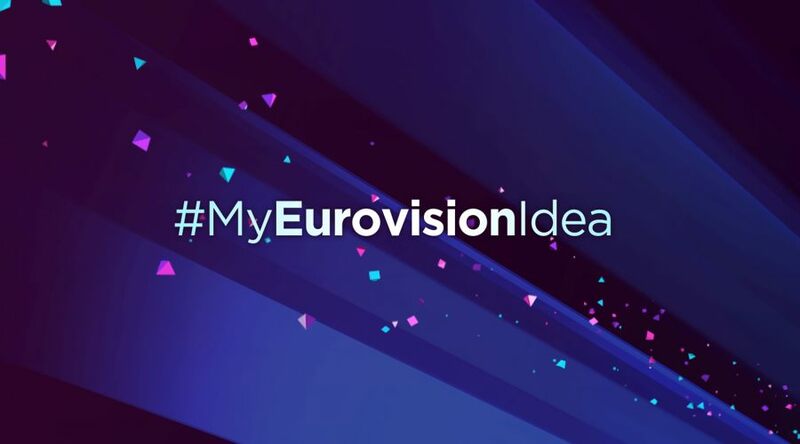 DR have launched the campaign using the hash-tag #MyEurovisionIdea, where fans are encouraged to share their ideas on Twitter, Facebook and Instagram. Fans have until 31 January 2014 to send in their ideas, and the best ones will be used for the two semi-finals and final in Copenhagen next year. "We want to make a feature born out of the viewers' ideas. We will use the most original, craziest and most beautiful ideas from all over Europe. I hope we will receive some ideas that we even in our wildest imagination couldn't think of. There are no ideas that are too large and no that are too small", says stage director Kenneth Kreutzmann. DR has also conducted dance auditions aiming to select 20 most talented male and female dancers for special performances in Eurovision shows. "They must be able to engage in choreography that is technically demanding and be able change styles reasonable smoothly", says chief stage director for the Eurovision Song Contest 2014 Kenneth Kreutzmann. The search is limited to professionals, but it is not limited to the Danish borders, invitations were sent also to Sweden, Norway and UK. Auditions took place on January 11-12 in the Opera house. Jan Lagermand Lundme, DR’s Head of Show says that the big change will be introduced in the format of the postcards, moving them away from the traditional approaches. "We are going to get rid of the postcards and produce portraits instead. We don’t want to show tourist films from Denmark or the participants' countries, but use the 50 seconds to create a little portrait of the participant who is going on stage instead . The viewers will get to know them so they can feel what sort of person is performing and standing on stage". This task DR will be implementing in collaboration with film company Treshow, filming will begin in early February. Countries have been given the task of creating their flag from any material, and with the country's representative at the center of the video. DR and EBU will be helping with filming sessions and production of the final videos. "We will show Denmark in a different way than through postcards. We are innovative and want to move competition in a more modern direction", explains Jan Lagermand Lundme. Запись церемонии вы можете увидеть на DR.dk и Eurovision.tv. 9 января 2014 года ЕВС объявил о том, что в конкурсе Евровидение 2014 примут участие 36 или 37 стран - Словении было дано еще 10 дней на принятие решения об участии в конкурсе. 17го января телевидение Словении также решило отправить своего представителя в Копенгаген, доведя общее количество участников до 37. Их соседи из Хорватии и Сербии, а также Болгария и Кипр решили отказаться от участия в конкурсе 2014 года. Босния и Герцеговина подавала предварительную заявку на участие, но в итоге решила, как и в прошлом году, воздержаться от него по финансовым причинам. В этом году на конкурс возвращаются Португалия и Польша. Грецию на конкурсе представит новая телекомпания NERIT, которая в настоящее время еще не является членом Европейского Вещательного Союза, но получила на это специальное разрешение. 37 вещателей, принимающих участие в конкурсе Евровидение 2014: Албания (RTSH), Армения (AMPTV), Австрия (ORF), Азербайджан (Ictimai TV), Беларусь (BTRC), Бельгия (VRT), Дания (DR), Эстония (ERR), Финляндия (YLE), Франция (France 3), Грузия (GPB), Германия (NDR), Греция (NERIT), Венгрия (MTV), Исландия (RÚV), Ирландия (RTÉ), Израиль (IBA), Италия (RAI), Латвия (LTV), Литва (LRT), Македония (MKRTV), Мальта (PBS), Молдова (TRM), Черногория (RTCG), Нидерланды (AvroTros), Норвегия (NRK), Польша (TVP), Португалия (RTP), Румыния (TVR), Россия (RTR), Сан-Марино (SRMTV), Словения (RTVSLO), Испания (TVE), Швеция (SVT), Швейцария (SRG SSR), Великобритания (BBC) и Украина (NTU). "Ряд вещателей уже сообщили нам о своем интересе вернуться на конкурс в 2015 году, когда мы будем отмечать 60ю годовщину конкурса Евровидение. Мы также продолжим работать вместе с вещателями, испытывающими трудности. ЕВС заморозил размер взносов за право участия в конкурсе, оставив их неизменными по сравнению с прошлым годом. В 2013 году мы уже уменьшили на одни сутки время репетиций, что позволило делегация уменьшить расходы на проживание в месте проведения конкурса. В этом году, телекомпании-организатору DR и ее местным партнерам удалось договориться о низких целях на проживание участвующих делегаций в отелях". Жеребьевка распределения на полуфиналы пройдет в понедельник, 20го января, в городской ратуше Копенгагена, где 28 стран будут разделены и разбиты на 2 полуфинала. Она будет в прямом эфире на Eurovision.tv и DR.dk в 17.00 Москвы. В этот же день Копенгагену представителями города Мальме будут официально вручены символические ключи от конкурса Евровидение. Церемонию посетят мэр Копенгагена Франк Йенсен, мэр Мальме Кент Андерссон, руководитель Евровидения Йон Ола Санд и генеральный директор DR Мария Рёрбю Рённ. Ведущие: Тине Гецше и Улла Эссендроп. Во время церемонии на Rådhuspladsen также будут запущены часы, производящие отсчет времени оставшегося до церемонии открытия конкурса. Швеция, Норвегия и Израиль уже были распределены по полуфиналам без жеребьевки. Швеция выступит в 1м полуфинале, а Норвегия и Израиль - во 2м. Распределение стран по 6 корзинам основывается на тенденциях голосования в каждой из стран за последние 10 лет. Этот механизм используется для того, чтобы предотвратить т.н. соседское голосование, и чтобы страны, обычно голосующие друг за друга, не оказывались все вместе в одном полуфинале. Еще одна часть жеребьевки определит, в какой части полуфинала выступят страны (1й половине или 2й половине полуфинала). Страны "Большой Пятерки" (Италия, Франция, Великобритания, Испания и Германия) и страна-организатор конкурса Дания также будут голосовать в полуфиналах конкурса и жеребьевка определи какая страна будет осуществлять голосование в каком из полуфиналов. Германия попросила разрешения голосовать в 2м полуфинале, и их просьба также была удовлетворена. Первая часть, составляющая примерно одну треть от общего количества билетов на шоу, поступила в продажу 29 ноября 2013 года в полдень по Москве на вебсайте Billetlugen.dk. Оставшаяся часть билетов будет продаваться 31го января и в апреле. В настоящее время все билеты на все шоу Финала Евровидения 2014 распроданы, но их новое поступление также ожидается 31 января. Первая часть билетов на финал разошлась за 75 минут. Всего, зал проведения конкурса будет вмещать в себя примерно 10 тысяч зрителей. Вокруг сцены будут три стоячие зоны, включая фан-зону. Сидячие места будут распределены по 6 секциям зрительного зала. DR назвало эти секции в честь предыдущих победителей Евровидения: Датских Emmelie, Olsen и Ingemann; и скандинавских Loreen, Rybak и Lordi. Все билеты будут направлены покупателям по обычной почте. Стоимость доставки составит примерно 3.4-4.7 евро (25-35 крон) в зависимости от месторасположения, сбор за обработку данных - примерно 4 евро (30 крон). ОГАЕ, Организации Фанатов Евровидения, было выделено 2000 пакетов билетов по специальной цене 2500 DKK (~335€) + сервисный сбор. В пакет вошли 6 билетов,3 на сами шоу, и 3 - на вечерние генеральные репетиции к ним. Фанклубы затребовали примерно 2300 билетов, потому небольшой доли фанатов конкурса пришлось дать отказ в их приобретении. 60% билетов были выданы на места в специальной стоячей "фан-зоне", а 40% на сидячие места, разделенные между двумя зонами, по обе стороны от сцены. Стоимость билетов на стоячие и сидячие места была одинаковой. Для того, чтобы приобрести ОГАЕ пакет билетов, у каждого члена должна быть членская карта клуба ОГАЕ со стикером 2014 года. Крайний срок подачи заявок на приобретение ОГАЕ пакетов прошел 16 декабря. Продажи билетов начались 18 января и продлятся до 26 января. Сами оригинальные билеты будут вручены членам соответствующими ОГАЕ клубами в Копенгагене, но e-mail билеты должны быть распечатаны как подтверждение оплаты. На наш клуб ОГАЕ Остальной мир было выделено право приобретения 73 пакета билетов, которые были разделены по просьбе наших членов на 60 стоячих и 13 сидячих. Всю свежую информацию, связанную с продажами, можно найти на нашей Facebook странице. Компания DIS Congress Service A/S была назначена ответственной за заселение в отели членов участвующих делегаций, прессы, спонсоров и аккредитованных фанатов конкурса. Несколько отелей Копенгагена в различных ценовых категориях были забронированы для этих целей. Каждый официальный отель будет обслуживаться бесплатным шаттл-автобусом до зала проведения конкурса. Вебсайт бронирования отелей и аккредитационная система открываются 21го января в 14.00 Москвы. Бронирование будет осуществляться в порядке живой очереди. После бронирования номера будет затребована предоплата. Все оплаты должны быть осуществлены в датских кронах банковским переводом. Первый взнос: в течении 8 дней после бронирования 20% общей стоимости; 2й взнос: 21го марта 2014 года - 50% общей стоимости; 3й взнос: 11 апреля 2014 года - оставшаяся стоимость. В случае снятия брони: если это сделано до 12 марта, полная оплата будет возвращена. Между 12 марта и 25 апреля, 25% от общего количества забронированных ночей можно отменить без штрафа. Отказы от брони, полученные после 25го апреля будут компенсироваться только в случае, если компании DIS Congress Service удастся сдать данную комнату другому постояльцу. В сентябре прошлого года вебсайт телеканала DR сообщил, что самым дешевым местом жительства в Копенгагене на Евронеделю по данным сайта Hotels.com является хостел за 9153 кроны (1226 евро) за неделю. Проверка на 18 января показала, что наиболее дешевой опцией является койко-место в 8-местной комнате хостела за 581 евро (4335 крон). Неделей ранее, можно остановиться в нормальном отеле за 3600 крон. Эти данные показывают, что цены на Евронеделю выросли по сравнению с обычными по меньшей мере в два раза. Один из крупнейших отельеров Копенгагена Arp Hansen также решил увеличить цены на проживание в своих отеля. Самым дешевым на сентябрь прошлого года был отель Gentofte, в котором можно было поселиться за 11334 кроны, в то же время за неделю до Евровидения цена той же комнаты составляла 8814 крон. На 15й неделе, то есть за месяц до Евровидения, ее стоимость была всего 5714 крон. Наиболее дорого останавливаться на Copenhagen Island. 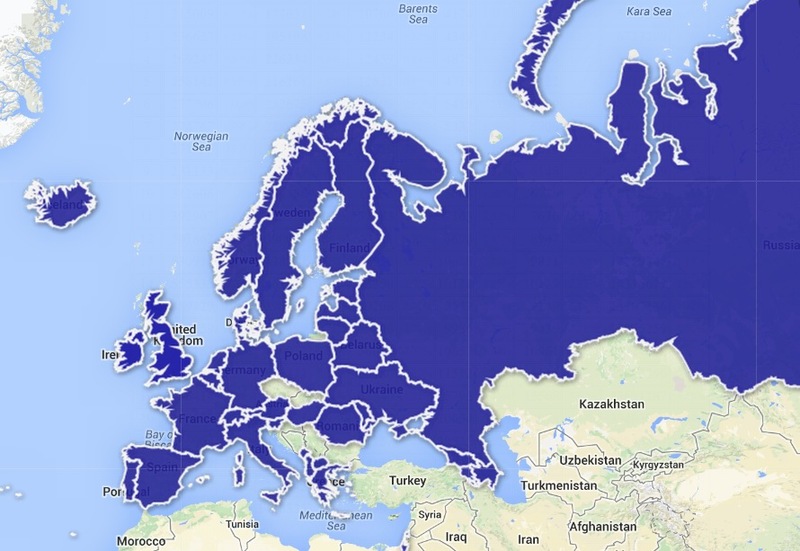 Стоимость комнаты во время Евровидения составляет 17 тысяч крон, за неделю до этого - 7988 крон, а за месяц - 5148 крон. Генеральный директор компании Arp Hansen Дорте Крак заявила: "Во время Евронедели в мае 2013 года наши отели были заполены большую часть месяца, потому что в это время происходит множество различных деловых и культурных мероприятий. Наши цены, конечно, отвечают тому, насколько мы оцениваем интерес к проживанию в отелях в тот или иной период. Месяц май сам по себе является одним из самых напряженных месяцев года, поэтому мы выставляем цены на комнаты в отеле на таком уровне после подсчета ожидаемого спроса". Копенгаген был выбран в качестве города, который примет у себя Конкурс Песни Евровидение 2014, как объявила 2го сентября 2013 датская телекомпания DR. Мероприятие пройдет на B & W Hallerne на острове Рефсхалеюн, под лозунгом "Join Us" (Присоединяйтесь к нам). Девиз "Присоединяйтесь к нам" означает близость к участникам, к музыке, к датчанам, к Европейцам и к конкурсу. Бывшая верфь будет подвергнута процессу необходимой реновации для того, чтобы на ней состоялись три высококлассных телевизионных шоу в следующем мае. Выбор был одобрен Европейским вещательным союзом и оргкомитетом, управляющим конкурсом от имени участвующих общественных вещателей. Копенгаген проводил у себя конкурс Евровидение дважды: в 1964 и 2001 года. Датская столица также организовывала 50-летний юбилей конкурса в 2005 году. "Мы с нетерпением ждем возможности поприветствовать всю Европу в Копенгагене, который полон культурного разнообразия, имеет отличную инфраструктуру и множество отелей. На выбранной площадке у нас есть возможность реализовать наши творческие амбиции. Весь район вокруг B & W Hallerne будет быть преобразованы в Остров Евровидения, где объединятся участники, журналисты и поклонники конкурса", говорит Пернилле Гордбо, исполнительный продюсер конкурса 2014 от телекомпании DR. "Копенгаген является одним из самых популярных туристических мест Европы и имеет все необходимое, чтобы провести мероприятие такого масштаба," говорит Йон Ола Санд, исполнительный супервайзер конкурса песни Евровидение от имени ЕВС. Он добавляет: "Выбранная площадка является смелым творческим ходом, и мы уверены, что хорошее сотрудничество между телекомпанией DR и городом Копенгагеном даст результат в видет таких трех шоу, которые Европа запомнит на долгое время!" Площадка B&W представляет собой уникальную часть международной индустриальной истории. Верфь, построенная на искусственном острове (или скорее полуострове) Рефсхалеюн в 1872 году, была в свое время мировым лидером в констуировании кораблей и разработке двигателей для них. Рефсхалеюн служил в качестве верфи до 1996 года. Сегодня - это площадка для индустрии культуры и развлечений, на которой расположены центры для отдыха, галлереи, пляж, рестораны и где уже проводилось несколько масштабных мероприятий, таких как фестиваль Copenhell или Scandinavia Reggae Festival, прошедший 30-31 августа. Во время последнего мероприятия площадка позиционировалась как находящаяся "всего в 10 минутах ходьбы от Христиании". Это - чистая зона с сырым и индустриальным видом, которая может быть идеально подогнана под любое масштабное мероприятие. Во многих зданиях, расположенных в ней и свободных территориях достаточно места для телекоманд, прессы, парковки, столовых, спонсоров и т.п. "У нас есть цель - модернизировать конкурс Евровидение, конечно с уважением к его традициям. Рефсхалеюн позволит нам создать полностью новое и уникальное шоу, поскольку мы сможем определять его рамки сами изнутри и снаружи. Мы сможем подогнать зал под все наши подтребности, и придать ему необходимые нам креативные характеристики", говорит Пернилле Гордбо, продюсер конкурса. "Мы уже работаем с лучшими техниками по аккустике и звукоинженерами, и они гарантируют нам, что звук будет полностью соответствовать требованиями профессионального телевидения". 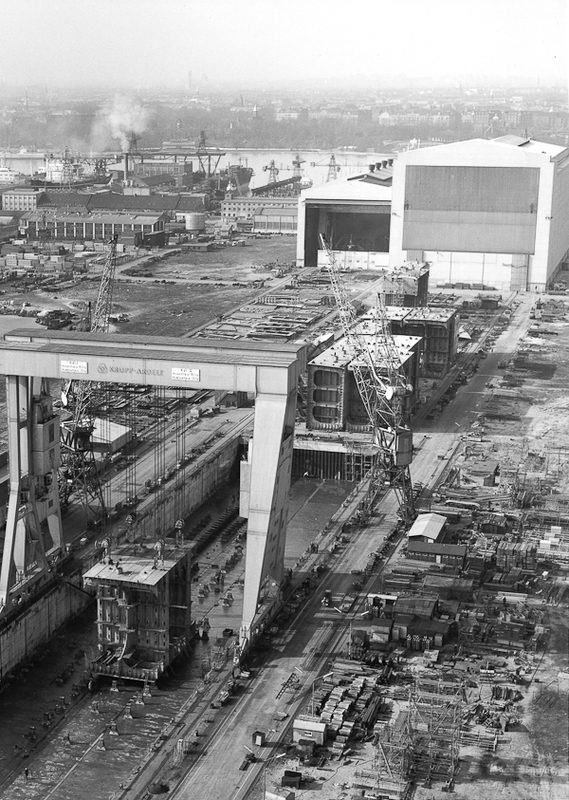 Сам конкурс пройдет в зале постройки начала 1960х, известном обычно как Jubii hallen (Gossip hall, названном в честь бывшего спонсора - датской поисковой системы, во время Евровидения будет использоваться не это название, а более простое - B&W hallen), также официально называемом Sektionshal 2 - это бывший завод по конструированию кораблей, в котором в настоящее время находится склда Королевского Театра, в основном все вещи упакованы в контейнеры. На высоте 50 метров протянут веревочный курс - используемый в коммерческих целях как зона для активного отдыха, совмещенный с сетью, натянутой на высоте 25 метров. На период Евровидения эта деятельность будет свернута и сеть собрана. Ранее в этом помещении также располагался центр для игры в гольф и еще в 2010 году он предлагался как подходящая площадка для самых крупных концертов. Зал имеет размер в 10000 кв.м., с измерениями 55x60x165. Ожидается, что во время конкурса Евровидение он сможет принять около 10000 зрителей и будет украшен и иллюминирован снаружи. В дополнение к нему, в качестве территории для делегаций и других служб, будет использована Copenhagen Paintball Arena - Sektionshal 1, непосредственно прилегающий к S2. Его также можно легко очистить. Его площадь - 6000 кв.м., измерения 45x50x115. Планируется, что два зала будут соединены и в них будет возведена трибуна для зрителей высотой 30 метров. Дополнительно будут построены офисы, VIP ложа, зоны для отдыха, рестораны. Пресс-центр планируется разместить в 200 м от основного зала в B&W Grand Ballroom - здание площадью в 8000 кв.м. сможет вместить в себя по меньшей мере 1500 журналистов. Интересно, что 3го мая в этом зале пройдет масштабный концерт - трибьют датским представителям на конкурсе Евровидение (En Hyldestkoncerttil Melodi Grand Prix 1957-2014). На сегодня неизвестно, насколько его проведение отразится на планах организовать в этом помещении пресс-центр. В отличии от Мальме, пресс-центр будет открыт с самого первого дня. В настоящее время Рефсхалеюн обслуживают только автобус 40 и водный автобус 991/992 (работающий только до 20.30, поскольку обычно водные перевозки не разрешаются в ночное время), метро к нему не проведено, потому добраться до этой площадки не так легко, как может показаться. Прилегающие улицы и так являются одними из наиболее загруженных в городе, потому будет достаточно сложным проложить к острову и большой шаттл-трафик. Организаторы, однако, заявляют: "Расположение площадки рядом с водой позволяет использовать альтернативные методы транспортировки как для зрителей, так и участников и журналистов". Заявочные документы говорят: "Развитая система Копенгагена позволит уменьшить количество используемых шаттл-басов, что будет оправдано и с точки зрения экономики и экологии. Все делегаты и пресса получат "Congress Travel Pass", позволяющий бесплатный доступ к метро, поездам и автобусам на территории города. Все делегаты и журналисты также получат доступ к велосипедам, которые они смогут использовать для своих поездок". "Мы наполним Остров Евровидения ресторанами, барами и развлекательными сценами. Он будет представлять среду, которая будет использовать существующие условия, но с особенной огранкой", говорит Ульрик Аммундсен, руководитель организации мероприятий в компании Wonderful Copenhagen. О существующих на Рефсхалеюне компаниях вы можете прочитать здесь. Вокруг будет построен Парк Евровидения, который на территории 40000 кв.м. помимо аттракционов и различных мероприятий предложит регулярные музыкальные выступления, а также возможность приобрести еду и напитки. Даже королевский корабль пришвартуют в гавани рядом с местом проведения фестиваля. Также Аммундсен рассказывает о том, что решающую роль будут играть волонтеры, поскольку они должны быть заметными и легко доступными. Wonderful Copenhagen принимал заявки от заинтересованных кандидатов на позиции волонтеров до 12го января. Условия: по меньшей мере 20 лет; свободное владение датским, английским и как минимум одним языком участвующей страны на свободном уровне со всесторонним знанием этой участвующей страны и Копенгагена/Дании. Волонтеры на позиции хостов делегаций (2-3 хоста для каждой страны) будут назначены в феврале после коротких живых прослушиваний и тестирования знания языков. Информационный семинар для них пройдет в начале марта. Ведущие встретят свои делегации во время их прилета в аэропорту и будут сопровождать их на всем протяжении пребывания в Копенгагене, являясь связующим звеном между делегацией и организаторами шоу. Всего спустя три дня после победы Дании в конкурсе Евровидение 2013, вещатель DR назначил исполнительного продюсера шоу 2014 - 47-летнюю Перниллу Гаардбо, которая работает в штате телеканала уже 17 лет, последние 12 - как руководитель DR Medieservice. Также в состав команды, отвечающей за планирование и продакшн конкурса Евровидение 2014 в Дании вошли - глава развлекательной части Ян Лагерманд Лундме и глава DR-ивента Сёрен Теркельсен. Всего к настоящему времени в составе DR над организацией конкурса уже трудятся около 500 человек. Одна из них - Йилль Паульссон, например, возобновит свою работу с Мальмё - она вновь будет главой делегационого сервиса. "Это центр внимания, который блистает и имеет твердую основу. У бриллианта есть нескольк граней и они показывают разнообразие и ценность, которую представляет собой выступление на сцене Евровидения. Это визуально подчеркивает тот подход, который мы применяем к Евровидению 2014: Грубые B&W Haller будут соединены с ярким, блистательным шоу, и в середине сцены, бриллиант является его объединяющей силой. Бриллиант действительно является самым лучшим материалом, поскольку он одновременно объединяет и заражает энергией. Если мы сможем воплотить в жизнь то, о чем мы мечтаем - зажечь присутствующих в зале и смотрящих шоу по телевизору людей - это самое лучшее, что мы можем достичь. Мы хотим показать это через символику бриллианта". Ян Лагерманд Лундме, отвечающий за шоу-часть конкурса, говорит о том, что у DR есть желание связать сценический дизайн и само шоу с очаровательной исторической индустриальной зоне, окружающей Рефсхалеюн. В настоящее время идет большая работа над тем, чтобы сохранить грубый и индустриальный вид, но в то же время DR постарается сделать все, чтобы обеспечить максимально хорошую аккустику в зале. "Прямо сейчас мы работаем над установкой сцены в самом центре B&W Hallerne, где будет проходить шоу, потому что сцена станет его центром, островом. Здесь будут блистать его участники". Клаус Зиер был назначен телекомпанией DR дизайнером сцены и будет отвечать за сценографию конкурса Евровидение 2014. Вместе с тремя другими архитекторами он уже работает 24 часа в день, чтобы создать отличные декорации в B&W Hallerne на Острове Евровидения в Копенгагене. Он является автором дизайна сцен таких масштабных шоу как X Factor, The Voice Denmark, Dancing With The Stars и Dansk Melodi Grand Prix, датского национального отбора к Евровидению. Его желание - создать самое огромное, самое красивое и неожиданное шоу, которым будут гордиться датчане, и которое объединит Европу. "Это - фантастическая возможность создать потрясающее шоу в этом грубом индустриальном зале. Как только я вошел в него, я сразу почувствовал сконцентрированную в нем историю. Трансформация, которой мы его подвергнем, будет невероятной. Сцена должны быть настолько сильной визуально, что хотя никто не будет сомневаться в том, что смотрит одно и то же шоу, но у каждой выступающей страны будет собственное самовыражение. Мы используем огромную имеющуюся высоту зала, и сделаем ее нашим преимуществом, мы хотим чтобы в этом пространстве творилось настоящее волшебство"
19го декабря телекомпания DR пригласила поклонников шоу подавать свои идеи того, какими бы они хотели видеть интервал-акты шоу конкурса Евровидение 2014. DR запустило кампанию использования хэш-тег #MyEurovisionIdea, под которым поклонники должны делиться своими идеями в социальных сетях Twitter, Facebook и Instagram. Фанатам было дано время до 31 января 2014 года публиковать свои идеи, и лучшие из них будут использованы в рамках проведения полуфиналов и финала конкурса в Копенгагене. "Мы хотим сделать номер, основанный на идеях телезрителей. Мы используем самые оригинальные, сумасшедшие и прекрасные идеи со всей Европы. Я надеюсь, что мы получим такие предложения, которые мы не могли представить даже в самых смелых фантазиях. Нет таких идей, которые были бы слишком большими или слишком маленькими для нас", говорит сценический режиссер Кеннет Крейцманн. Телеканал DR также провел танцевальные прослушивания для того, чтобы выбрать 20 наиболее талантливых танцоров для специальных выступлений в рамках шоу Евровидения. "Они должны быть способны исполнить хореографию, которая является технически очень сложной и уметь быстро и четко менять различные стили", говорит главный сценический режиссер шоу Кеннте Крейцманн. Для прослушиваний были приглашены только профессионалы, и приглашения также были направлены за пределы страны - в Швецию, Норвегию и Великобританию. Прослушивания прошли 11-12 января в Оперном театре. Ян Лагерманд Лундме, отвечающий за шоу-часть конкурса, говорит, что большим изменением, внесенным в этом году в формат открыток (посткардов) будет удалить их от традиционного подхода. "Мы избавимся от посткардов и вместо этого сделаем портреты. Мы не хотим показывать туристические фильмы о Дании или участвующих странах, но использовать эти 50 секунд для создания короткого портрета участников, которые выходят на сцену. Зрители смогут познакомиться с ними, почувствовать, что это за человек выступает и стоит на сцене". Эту задачу DR будет выполнять в сотрудничестве с компанией-производителем фильмов Treshow, съемки начнутся в начале февраля. Странам дали задачи создания своих национальных флагов из любого материала, и чтобы в центре ролика был сам представитель этой страны. DR и ЕВС помогут в проведении съемок и производстве итоговых роликов. "Мы покажем в шоу Данию другим способом, а не через посткарды. Мы подходим к этому вопросу инновационно, и хотим направить конкурс в более современном направлении", объясняет Лагерманд Лундме. 10го декабря было объявлено, что датская телекомпания DR получил 29.8 млн крон на проведение конкурса Евровидение 2014, что представляет собой половину суммы лицензионных сборов, оплаченных телезрителями Дании в 2012 году, а оставшаяся часть будет разделена между вторым телеканалом Дании TV2 и фондом государственной службы. Эти деньги пойдут на покрытие расходов на организацию конкурса, и будут добавлены к 40 миллионам крон, уже выделенных на эти цели мэрией Копенгагена. Всего же бюджет общий шоу оценивается на том же уровне, что и в Мальме - 190 млн крон, и потому в настоящее время DR активно ищет спонсоров для покрытия его дефицита.